December 22, 2013 — Sorry state of affairs: Overgrown vegetation and debris obstruct the monument and historic plaques placed at the Lang Station site in 1976 for the centennail of the rail linkage between Los Angeles and San Francisco. One plaque identifies the spot where Charles Crocker drove a golden spike, while the other honors the Chinese immigrant workers who built the railroad. Former California Secretary of State March Fong Eu, who participated in the 1976 centennial celebration, rededicated the plaques upon the 125th anniversary in 2001. They're supposed to look like this. SPRR President Charles Crocker drove the last spike connecting Los Angeles and San Francsico by rail on Sept. 5, 1876. The location was already known as "Lang," as it was the place where homesteader John Lang had built a hotel in 1871 where health-conscious patrons could enjoy his hot, sulfurous springs (ergo, Sulphur Springs). 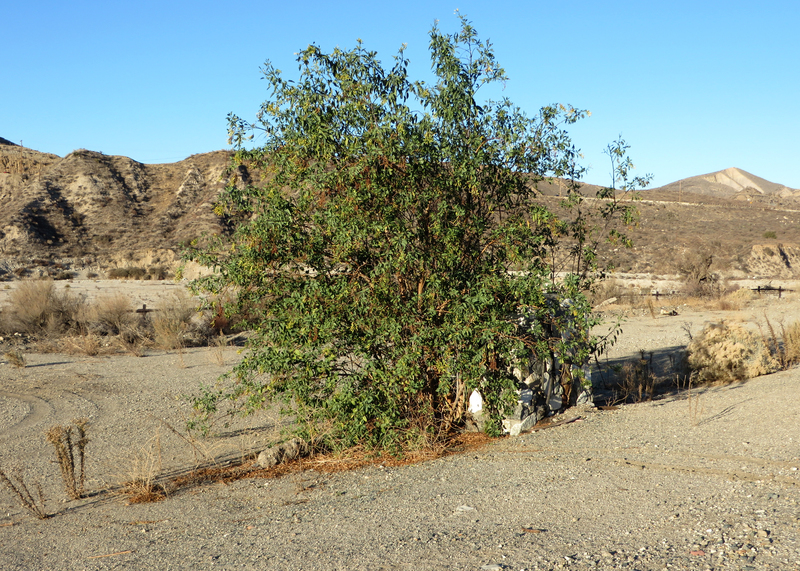 It was located in present-day Canyon Country, one-quarter mile east of the Shadow Pines exit from today's 14 Freeway. We're unfamiliar with photographs of the first Lang station, which was built circa 1873 as a stage station for Remi Nadeau's freighters out of the Cerro Gordo mines. According to historian John Sweetser, the first Southern Pacific depot at Lang was established in 1884 (source: Los Angeles Daily Herald, Aug. 29, 1884). "It's not known if the first depot was a regular building or a converted railroad car of some type," Sweetser writes. The next depot, which was a regular building, opened in January of 1888 (source: Los Angeles Daily Herald, Jan. 27, 1888). This depot burned down Aug. 14, 1888 (see news story here; also a letter from a Lang resident to the editor of the San Francisco Examiner, Aug. 22, 1888). The third depot, which is pictured on pg. 66 of "Railroading Through the Antelope Valley," burned down Oct. 5, 1906 (see L.A. Times story, Oct. 6). The fourth depot was established in the section foreman's house and remained in that building until it was closed May 9, 1968. "The depot closed due to the lesser need for train order offices on the Soledad Canyon line due to the opening of the Palmdale cutoff in 1967, which diverted freight traffic," Sweetser writes. Despite being proclaimed a State Historic Landmark on June 15, 1957, the depot was torn down within a year after its May 1968 closing. "When I visited the location in the late spring of 1969 while I was attending Long Beach State College, the depot was no longer there," Sweetser writes. The 1957 state landmark plaque reads: "LANG SOUTHERN PACIFIC STATION / On September 5, 1876, Charles Crocker, President of the Southern Pacific Railroad drove a gold spike to complete his company's San Joaquin Valley line. First rail connection of Los Angeles with San Francisco and transcontinental lines. / REGISTERED HISTRORICAL LANDMARK No. 590 / Plaque placed by California Park Commission in cooperation with Historical Society of Southern California, June 15, 1957." It wasn't the first recognition of Lang's important role in the development of Southern California. On Sept. 5, 1926, railroad enthusiasts and history buffs descended on Lang for a 50th anniversary celebration of the driving of the golden spike. A modern Southern Pacific engine was outfitted with a smokestack and renumbered No. 38 for the occasion, the same number borne by the 10-wheel engine that lumbered south from Tehachapi in 1876 to meet the eight-wheel engine No. 25 that drove north from Los Angeles. For the golden anniversary celebration, some revelers donned cowboy and Indian garb. A half-century later, on Sept. 5, 1976, the depot was gone but several organizations including the Santa Clarita Valley Historical Society (then 1 year old), the San Fernando Valley Historical Society, Chinese Historical Society of Southern California, Railway & Locomotive Historical Society and E Clampus Vitus (a fun group of history buffs who clamp plaques to sites that need them) gathered at the site to commemorate the 100th anniversary. The occasion was noteworthy because this time, care was taken to recognize the contributions of the Chinese immigrant track layers who did the bulk of the work. Two bronze plaques were placed at the site, one by the Chinese Historical Society reading: "On this centennial we honor over three thousand Chinese who helped build the Southern Pacific Railroad and the San Fernando Tunnel. Their labor gave California the first north-south railway, changing the state's history." The second plaque, placed by "Platrix Chapter No. 2" of E Clampus Vitus, reads: "LANG STATION / On this exact site (or hereabouts) 100 years ago Clamper Charles Crocker drove a spike of pure California gold completing the Southern Pacific Railroad link between San Francisco & Los Angeles, Queen of Counties / Dedicated September 5, 1976." Perhaps they considered Crocker a fellow clamper because he had clamped the rails together. "We stand today on hallowed ground, consecrated by the blood, sweat and tears of 3,000 laborers of Chinese ancestry who were hired to build the railroad linking Los Angeles and San Francisco 125 years ago today. As with the building of the first Transcontinental Railroad, it was the Chinese laborers who carried out the vision of railroad magnate Charles Crocker, doing what others would not, or could not, do. They battled solid rock, blistering heat, and desiccating winds. Cave-ins, boiler explosions and breaking cables claimed lives and limbs. As they cut their way through the San Fernando mountains, their daily progress was measured by fractions of an inch, not by feet or yards or rods. The 7,000-foot-long San Fernando Tunnel remains as one of the state's engineering marvels. For most of 1875 and 1876, they trudged forward from the south and from the north. And 125 years ago today, the rails met here at Lang Station with the driving of a Golden Spike. "Chinese laborers had, once again, done the impossible," she continued. "But they received no credit for their triumph. In fact, the final 1,000 feet of track was laid by Caucasian workers  adding insult to the racist injury the Chinese routinely endured at the time. This afternoon, we pause to commemorate those who linked California with steel 125 years ago. We pause to honor the Chinese laborers who made it happen and their spirit that lives on today." Eu and Leon Worden, then-president of the SCV Historical Society (and a fellow participant in the 1976 ceremony), performed a reenactment of the driving of the spike, while members of the Chinese Historical Society of Southern California and fourth graders from Pinecrest Elementary School in Valencia took turns hammering the replica spike into the tracks. For the sake of historic context, six days later, al-Qaida terrorists downed four U.S. passenger jets. Metrolink added outbound trains on all lines between 9 and 10 a.m. that day so riders stranded in Los Angeles could get home. Metrolink trains remained in service; regional rail authorities stepped up inspections of tracks, bridges and overpasses, and increased the number of uniformed sheriff's deputies at train stations and platforms. Read the 1976 version of the Golden Spike story here, and see photos of the spike here. LW2545g: 19200 dpi jpeg from digital image by Leon Worden.